Stay warm on your next adventure with the Excursion Pack! Each pack contains 8 pairs of 7 hour Hand Warmers, 8 pairs of 6 hour Adhesive Toe Warmers and 8 Peel 'N Stick Body Warmers that last over 12 hours. Great for home, car, work or give it as a warm gift. Grabber Warmers are odorless, long-lasting sources of personal heat that are environmentally friendly. Stay warm on your next adventure with the Excursion Pack! Each pack contains 8 pairs of 7 hour Hand Warmers, 8 pairs of 6 hour Adhesive Toe Warmers and 8 Peel &apos;N Stick Body Warmers that last over 12 hours. Great for home, car, work or give it as a warm gift. Grabber Warmers are odorless, long-lasting sources of personal heat that are environmentally friendly. 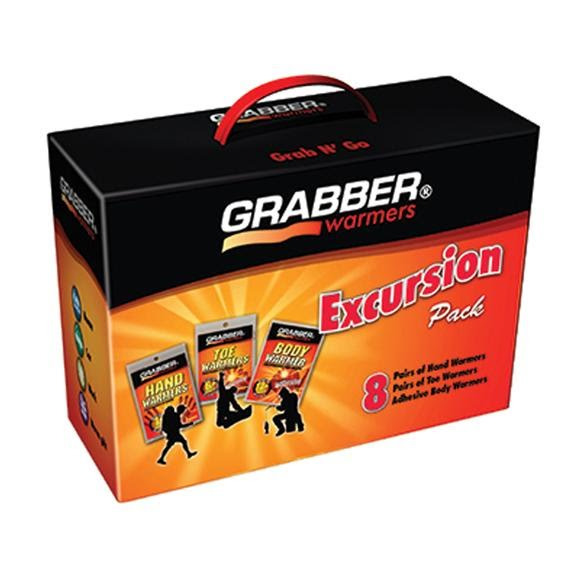 When you&apos;re done with the Excursion Pack, just fill it with more Grabber Warmers!